Education HOME / Geodesy / What is Geodesy? Using spatial reference systems created by geodesists, any location on the Earth can be located quickly and accurately. Click on the image for an animated view. Geodesy is the science of measuring and monitoring the size and shape of the Earth. Geodesists basically assign addresses to points all over the Earth. If you were to stick pins in a model of the Earth and then give each of those pins an address, then you would be doing what a geodesist does. By looking at the height, angles, and distances between these locations, geodesists create a spatial reference system that everyone can use. Building roads and bridges, conducting land surveys, and making maps are some of the important activities that depend on a spatial reference system. For example, if you build a bridge, you need to know where to start on both sides of the river. If you don't, your bridge may not meet in the middle. As positioning and navigation have become fundamental to the functions of society, geodesy has become increasingly important. The earth's crust is made of up separate plates that ride atop a sea of magma. These plates are constantly shifting and interacting. Click on the image for an animated view. Geodesy helps the transportation industry ensure safety and reliability, while reducing costs. Without geodesy, planes might land next to -- rather than at -- airports, and ships could crash onto land. Geodesy also helps shipping companies save time and money by shortening their ships' and airplanes' routes and reducing fuel consumption. Geologists, oceanographers, meteorologists, and even paleontologists use geodesy to understand physical processes on, above, and within the Earth. Because geodesy makes extremely accurate measurements (to the centimeter level), scientists can use its results to determine exactly how much the Earth's surface has changed over very short and very long periods of time (Careers in Geodesy, 1986). The Earth's surface changes for many reasons. For instance, its surface rises and falls about 30 centimeters (about 1 foot) every day due to the gravitational influences of the moon and the sun. The Earth's outermost layer, the crust, is made up of a dozen or more "plates" that ride atop a sea of molten rock, called magma, which flows beneath the surface of the Earth. 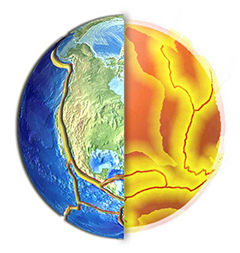 Plate tectonics is the scientific discipline that looks at how these plates shift and interact, especially in relation to earthquakes and volcanoes. Although these phenomena are violent and usually affect large areas of land, even smaller events, such as erosion and storms, have an impact on shaping the Earth's surface. Geodesy helps us determine exactly where and how much the Earth's surface is changing.